This royally inspired invitation from the Bonnie Marcus Collection features a bride holding a bouquet of white flowers. 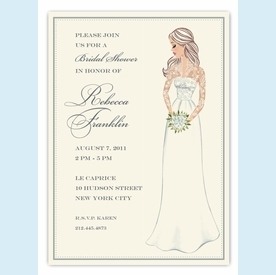 This stylish invitation is expertly printed on luxurious warm white heavyweight paper (recycled and FSC certified). A portion of the proceeds from the sale of this product is donated to breast cancer research and education. Warm white envelopes included. 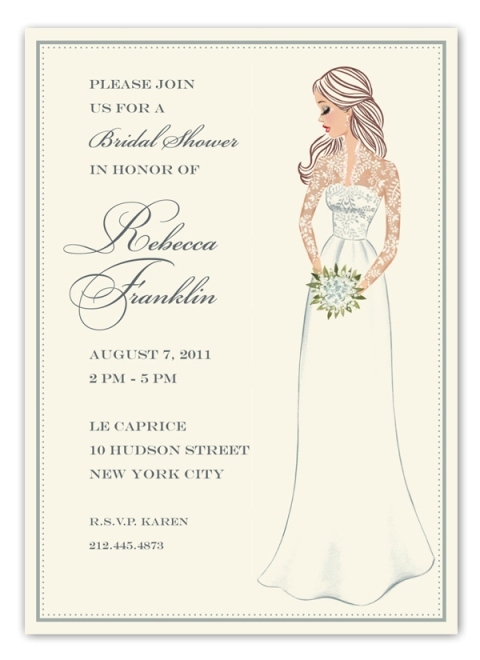 Optional: Add hand-applied sparkles to your invitations for just $4 extra per set. Clear glitter on dress neckline. Please note in the "Comments" section if you wish to add sparkles or add Bonnie Marcus Sparkles to your shopping bag. Drop-ships via UPS Ground from NY; please allow one additional week for us to receive product if you're ordering custom printing. Minimum order quantity is 2 sets.